The 24/7 Learning Academy Success Driven Education Method is built around the concept that developing essential empowering lifelong skills is the key to success. Rather than build our school programs around specific content and subjects, we have designed our programs around the teaching of skills. Learners sharpen these skills by completing projects, designing their own educational program, completing internships, and participating in activities that make a difference in the world. We realize that the true development of a learner is not solely based on the subjects they learn or programs offered to them, but the development of a set of skills that will allow them to be successful and stand out in any situation. 1. OUR LEARNER OUTCOMES DEFINE WHO AND WHAT WE WANT OUR GRADUATES TO BE. We believe these outcomes support our learners to be successful college graduates, entrepreneurs, and leaders of innovation and social justice. 2. 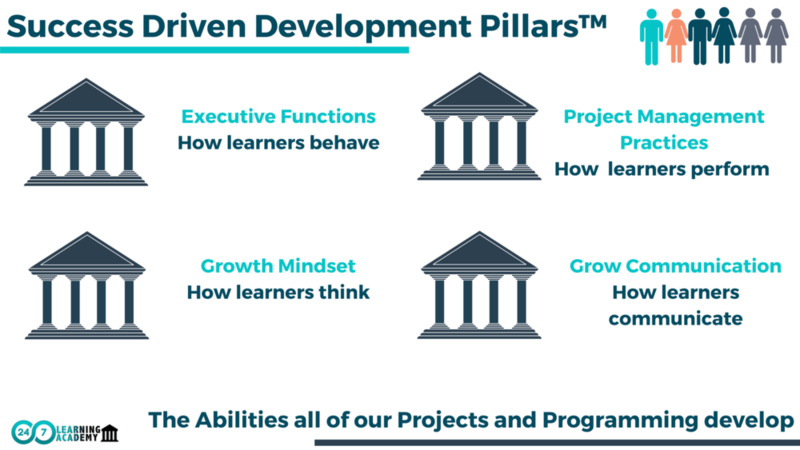 OUR DEVELOPMENT PILLARS DEFINE THE PURPOSE OF OUR CURRICULUM AND PROGRAMMING AND WHAT THEY SHOULD ACCOMPLISH. We believe it is our responsibility to develop learners from the inside-out and outside-in. 3. OUR SUCCESS STANDARDS REPRESENT THE SKILLS OUR GRADUATES WILL HAVE. We believe having these skills will allow our learners to attend the college of their dreams, create their own companies, careers, and pathways to success. 4. OUR PBL DESIGN FRAMEWORK GUIDES HOW OUR CURRICULUM, INSTRUCTION, AND DAILY PRACTICES ARE DESIGNED TO SUPPORT LEARNERS TO BE SUCCESSFUL THROUGH DELIBERATE PRACTICE. We believe every Learner deserves an opportunity to develop their genius without labels. 5. OUR ASSESSMENT RUBRICS ASSESS STUDENT SKILLS, EFFORT, AND PROGRESS FIRST, AND CONTENT KNOWLEDGE LAST. We believe success in any situation is not just based on what a learner knows but what they can do with it. HAVE QUESTIONS? WANT TO SPEAK TO AN INSTRUCTIONAL SPECIALIST?